Thailand’s currency is the Thai Baht (THB). With only little fluctuation in foreign exchange rates, the Baht is one of the most stable currencies in South-East Asia. One Baht is subdivided into 100 satangs. Due to their low value, however, only 25 and 50-satang coins are still in use and – other than receiving them as change at a 7-Eleven store – most tourist will hardly ever get to use satangs. The most frequently traded coins are 1, 5 and 10-Baht coins. On one side, they all display an image of the king, while the other side typically displays images of various temples. Therefore, it’s not “heads or tails” in Thailand but “king or temple”. Newly-established 2-Baht coins, easily to be confused with 1-Baht coins or satangs, are still relatively rare. Banknotes in Thailand come in denominations of 20, 50, 100, 500 and 1,000 Baht. They all differ in colour and size but – without exception – display an image of the Thai king on the front. Banks in Thailand close rather early, generally at 3.30 p.m.; only branches in shopping malls or in major tourist areas may close a couple of hours later. Most tourists will therefore likely use money exchange booths that stay open until the late evening hours. 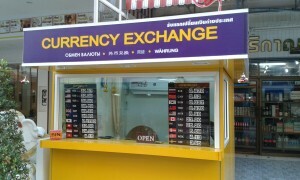 Probably more than one hundred exchange booths can be found all over Pattaya, exceedingly in locations with plenty of tourist traffic, e.g., South Pattaya Beach Road or Walking Street. Aside from a number of private money changers, most currency exchange services are provided by banks and exchange rates do not vary significantly. Depending on the amount of money you want to exchange, however, it might be wise to compare the exchange rates offered by different banks before changing a larger amount. All “established” Western currencies are accepted, either in cash or as traveller cheques (better exchange rates and higher security in case of loss). Do not change your money upon arrival at the airport or at hotel receptions. Rates offered by exchange booths at Suvarnabhumi Airport and at the reception desks of local hotels are usually well below the average. Shopping malls, upscale hotels and restaurants and similar tourist-oriented businesses are likely to accept payments by credit card as well (all major credit cards accepted). 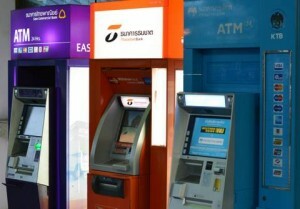 If you travel with an international credit card, or have a Thai bank account and Thai debit (ATM) card, you should easily find an ATM (automatic teller machine) anywhere in Pattaya. Most ATMs offer easy-to-operate menus in Thai and (usually) English language and allow you to withdraw cash instantly. In general, they provide reliable services but may sometimes crash late at night, especially on weekends or public holidays. Hundreds of ATMs are located outside banks, 7-Eleven stores, shopping malls etc. 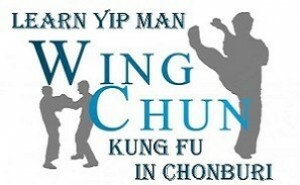 all over Pattaya. Especially with a 7-Eleven store at nearly every street corner now, you’ll hardly ever have to walk longer than five minutes to find an ATM anywhere around town. In general, all major credit cards are accepted and should work with most ATMs (just always look out for the appropriate logo). In November 2015, transaction fees for withdrawing money with foreign ATM cards were raised from 180 to 200 Baht, so it’s definitely more economical to withdraw only larger amounts at a time. If you have a Thai debit card, no transaction fee applies if you use an ATM provided by your bank; when withdrawing cash from other banks’ ATMs, the service fee is usually 20 Baht. For safety reasons it’s recommended not to carry large amounts of cash on you. This applies even the more so when you’re exploring Pattaya’s notorious nightlife or strolling along Pattaya Beach Road in the early morning hours when the dimly-lit promenade turns into a meeting point for freelance prostitutes, ladyboys, and similar creatures of the night. 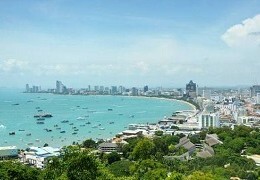 Although Pattaya, in terms of crime, is still “relatively safe” in comparison with other destinations in the South-East Asian region like, say, the Philippines or Cambodia, there are regular reports of bag snatching, necklace theft, night-time robberies etc. from (often unnecessarily careless) travelers. Do not provoke potential wrongdoers by visibly displaying larger sums of cash in public places, or by wearing eye-catching jewellery and gold necklaces which might draw the attention of potential robbers. Pay the same attention to your wallet, handbag, mobile phone etc. as you would do when visiting less safe exotic destinations. While we think Pattaya’s Baht buses, just to give an example, are a great way of getting around the city at an unbeatable cheap rate, beware of a rising number of ladyboy pickets possibly traveling on the same Baht bus as you and learn how to avoid them. 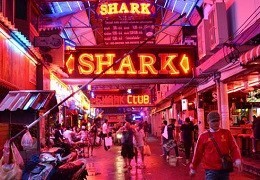 Pattaya provides a safe environment for tourists; due diligence, though, is always recommended. For maximum security, it’s recommended to deposit your money in a safety box at the reception desk of your hotel. Safety boxes are provided by most hotels and guesthouses as well as a few private safety box providers. Many hotels also provide in-room safes where you can deposit your cash and other valuable items. If you stay in Pattaya for longer than just a couple of weeks and visit the kingdom regularly, you might also consider opening a Thai bank account. It’s certainly most convenient (and more economic too) for long-term tourists and expats to open a Thai bank account and apply for a Thai debit card. A Thai ATM card won’t just enable you to withdraw cash from ATMs nationwide but also help you save a bit of money. No transaction fees apply when you use ATMs provided by your own bank; when withdrawing cash from other banks’ ATMs, the transaction fee is usually just 20 Baht. Electronic money transfers within Thailand are also quick and reliable if you have a Thai ATM card; however, such transactions are only possible at ATM machines owned by your partner bank or via internet banking. It’s usually free to open a bank (savings) account in Thailand, with no minimum deposit required. An ATM card costs about 500 Baht. Fixed deposit and foreign currency accounts are also available. 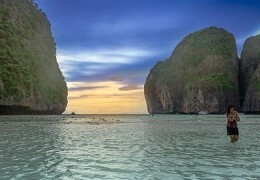 In order to open a bank account in Thailand you will officially need your passport, a long-term (non-immigrant) visa, possibly with a valid work permit, and some kind of certificate of residency. An official residency certificate can be obtained from a local immigration bureau (for Pattaya residents, this is on Jomtien Soi 5); expect that you’ll have to submit a copy of your lease agreement or some similar paperwork from your landlord. While these official requirements are rather strict and increasingly being enforced, in some cases, a simple tourist visa might be sufficient and no further form of documentation other than your passport required. A simple smile and polite behaviour are always helpful in the “Land of Smiles” and may enormously ease otherwise “complicated” official requirements. While there’s certainly no guarantee, it’s also recommended to try your luck at smaller bank branches located outside the main tourist areas, and perhaps have a Thai friend accompany you. If they should refuse your application at one bank, simply move on to another bank, or try your luck at another branch of the same bank. A Thai bank account also allows you to take maximum advantage of foreign exchange rate fluctuations when you’re back in your home country. For example, if you monitor the Baht exchange rates on a regular basis, you can always – in case of an extraordinary weakening of the Baht – simply transfer money from your home bank account to your Thai savings account and then profit from the savings during your next holiday. On average, a money transfer to a Thai bank account will take between three and five working days. If you want to transfer a larger sum of money from your home country to your Thai bank account, it’s highly recommended to ask your home bank for a document which states that the respective amount has been legally transferred from abroad and was due to foreign exchange rates. Such a document is officially required if you want to take a larger amount of money out of Thailand again or wish to purchase a condominium with it. Note: IBAN codes are not yet provided by Thai banks. For money transfers to Thailand you must therefore indicate the SWIFT code of the respective bank. All details necessary for international bank transactions can be obtained from any branch of your bank. Western Union allows you to send and receive money worldwide within minutes and is probably the fastest and most convenient method to transfer money from and to Thailand. Their services can be extremely helpful if you should unexpectedly run out of cash before your holiday is over or when(ever) your Thai girlfriend urgently needs cash. Funds can be sent online or via a Western Union agent and may be received at one of Pattaya’s Western Union service points, where payments will be made cash in Thai Baht. 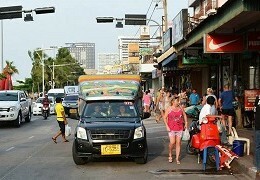 Western Union agents can be found at various locations around Pattaya such as shopping malls, banks and post offices. For a full list of Western Union agents in Pattaya, please use the “Find a location” function on their website, click “Chonburi” in the scroll-down menu and “submit”. Before sending or requesting money you have to make sure that both the sender and receiver fill in the same contact details on the sending/receiving forms. A 10-digit transaction code will then be issued, which the sender must pass on to the recipient. To receive cash instantly, all you need is your passport, the correct 10-digit transaction code and contact details. While this is all very simple and convenient, one major disadvantage is that their services are rather expensive and they charge a relatively high percentage of the amount of money being transferred. There’s also a minimum charge per transaction, no matter how low the amount is that you send or receive. PayPal is one of the world’s largest online money transfer companies that allows users to send and receive money to/from anyone in the world with a PayPal account. If you want to start some kind of internet-based business in Thailand, for example, it will be indispensable for you to have a PayPal account. Since 2006, it’s also possible to send/receive online payments via a Thai-verified PayPal account, i.e. 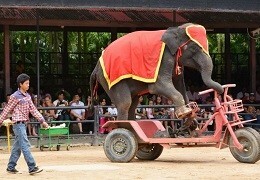 an account set up in Thailand. By simply adding a Thai credit card to your (Thai) PayPal account, you can easily link your PayPal account to your local Thai bank account. Once your account has been verified, you can withdraw and transfer funds from your PayPal to your bank account. Thai credit card? While it may be possible to hook up certain Thai debit cards to Thai-registered PayPal accounts and so verify them, most Thai banks still don’t co-operate with PayPal and won’t allow you to hook up a debit card to a PayPal account. And as mentioned above, it’s virtually impossible for foreigners to get a credit card from a Thai bank. But fortunately, there’s a simple alternative. When you open a savings account with Kasikorn Bank, do apply for online banking at the same time. Upon application you will receive a code, sent to you via email within usually one working day, which you can use to log into your “K-Cyber Banking” account on their website. Once logged in, you can apply for their so-called “K-Web Shopping Card”. This virtual credit card – basically just a code and not a physical card – may then be used to verify a Thai PayPal account.